Inspired from the floral delicacy of passionate Roses, the Inatur Geranium Rose Body Mist has a purifying fragrance that lingers all day long and gives you a fresh feeling. This body mist is inspired from Rose Centifolia and Geranium Essential oils. It has a soft and floral fragrance that is harmonious and reassuring. Additional Information :Inatur is a renowned beauty brand that focuses on world-class skin care products made of 100% natural ingredients. Constant innovation and quality drives this company towards success. 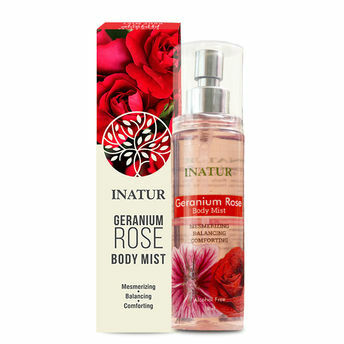 Inatur Geranium Rose Body Mist gets you one step closer to nature.